Biography* � Winston Aaron's birth was recorded in the M. J. Culpepper Family Bible: "Winston Aaron was born Aug 7, 1922"
Winston became a San Antonio patrolman on December 15, 1952. While investigating a fatal traffic accident in the 3300 block of S.W. Military Drive, Culpepper was struck and killed by a drunk driver. He was 32. Winston Aaron Culpepper, 7 Aug 1922 – 11 Sep 1954, AMMI US NAVY WWII. Aaron Winston Culpepper, born 7 Aug 1922 in Wilson Co., TX. Winston Aaron Culpepper, died 11 Sep 1954 in Bexar Co., TX. Frances Garland Culpepper, 7 Dec 1925 – 9 May 1956, PFC US Army WW II. Francis Garland Culpepper, born 7 Dec 1925 in Wilson Co., Texas. Francis G Culpepper, died 9 May 1956 in Brooks Co., TX. Joi Estelle Culpepper, Female, born __ 1928 in Wilson Co., Texas, child of Mathew John Culpeper and Lela Myrtle Hawk. Ruben C. Culpepper, 6 Jul 1913 – 17 Dec 1997. R C Culpepper, born 6 Jul 1913 in Wilson Co., TX. Ben Curtis Culpepper, Male, born 24 Nov 1941 in Bexar Co., Texas, child of Rueben Curtis Culpepper and Mary Gladys Mccabe. Ben Curtis Culpepper, 24 Nov 1941 – 3 Mar 1980. Ella R. Culpepper, Female, died 19 Dec 1976 in Wilson Co., TX. Ben Curtis Culpepper, Male, died 3 Mar 1980 in Travis Co., TX. Rueben Curtis Culpepper, Male, died 18 Dec 1997 in Bell Co., TX. Merle Culpepper, 2 Nov 1921 – 22 Oct 1938. Francis Merle Culpepper, born 2 Nov 1921 in Wilson Co., TX. Merle Culpepper, Hays Co., Oct 22 1938, 46262. 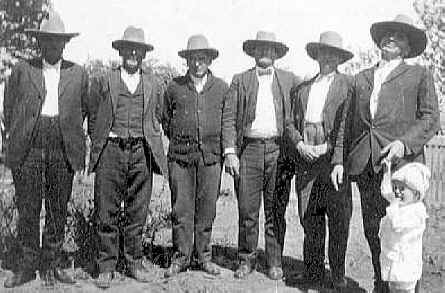 Lavaca Co., TX: Francis C. Culpepper and Julia Brannon, 5 Aug 1903, Book VI, p. 207. Julia Culpepper, Wife, F, 30, M1, md-7 yrs, ch 0/0, TX LA TX. Ruby A. Culpepper, Dau, F, 13, S, TX/TX/TX. Francis Cary Culpepper, died 12 Apr 1955 in Bexar Co., TX. Julia Tabitha Culpepper, Female, Widowed, died 12 Oct 1968 in Bexar Co., TX. Ben F. Culpepper, Boarder, M, 28, S, TX AL AL, Painter-Houses. Benjamin Culpepper, Boarder, M, 38, Sng, TX/GA/AL, Street Car Conductor. Elizabeth Culpepper and Walker Myers, 30 Sep 1906, Karnes Co., TX. E-mail written Oct 2005 to Warren Culpepper from Penny Lynne Myers McCarty, e-mail address. ED 7, Page 10B, Luling, Caldwell Co., TX. Ruby Anna Culpepper, born 14 Sep 1916 in Bexar Co., Texas. Biography* � Leonora Leslie was the daughter of John and Emily Miriam (Culpepper) Culpepper. Lela was born after the Civil War and, according to her obituary, she was born "near Huntsville. "2 Nothing is known of her father beyond the family tradition that his name was John Culpepper. It can only be speculated but cannot be proven that this was John Culpepper a son of James and Martha (Blackstone) Culpepper. He is presumed to have died when Lela was an infant since he has not been located in 1870 census records and Lela's mother had remarried by 1870. Lela emerges in census records in 1870 in the household of her father-in-law, Broxon Yarbrough Carlisle. 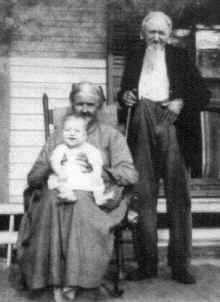 Lela is recorded with her mother and step-father in the 1880 census of Flatrock, AL. Flatrock was apparently near Almond to the west of what is now Wadley, AL. In 1884, Lela married J. Frank Gilbert by whom she is known to have had one child who died as an infant. J. Frank Gilbert is believed to have died before 1890 since that is when Lela was married a second time, this time to Stephen Patrick Green. Lela and Patrick settled down to raise their family in the Green family home, "The Old Home." I came to my Dear old Home early this A.M. went out to the Family Cemetery where his Father, Mother, and brother and one of our Sons that was born dead 1903 were Laid. I Sat down to rest there where he had walked and worked all these years. He use to Keep the Graves Cleaned all time he would Sweep all around there. The Grape Vines are there where we use to gather a lot of Summer Grapes there was the Persimon Tree. Not far away was the wild Cherries and Chesnut Tree we use to gather all these and enjoyed them Together. Then I walked where the Pines are Growing where he would Cut and Split Stove wood to Cook our Daily meals. Oh I could see So many Places where he worked would go Carry him a Cool drink of water. He would stop and rest awhile and talk. He always Kept Plenty dry wood to Cook with and Kindling. I never Cooked with wet wood never Borrowed Meal, Flour, Meat, Lard, Sugar. I borrowed Salt one time I remember. I think that is a Record hard to beat and Live with the man almost 50 years. I sat there that April morning all these things Came to my mind as I gazed out in Space. I Came to the well of very good water where he used to draw and drink. Can almost See him now drinking out of the bucket after he would drink would come Sit on the Grind Rock bench and pull off his old Straw Hat and Fan with it. Then I walked to the old Home Place where we cleaned up the rubish just finished a few days before he left. He Tore the old Home down in 1939 where he was born had it all Cleaned up he Said I am going to Plant Corn where the old Home Stood. But he never Planted Corn though he planned and the man was to Come and Plant it for him the day he passed. Then I walked to the garden where he had just walked it the day before he went. Then I walked where he Cut a lot of Cedar Parts that Spring then to the Crib and Barn he had builded Several years ago then I went to the 2 Wood Houses he made, on to the Mail Box where he met the Postman for years on to the Wagon House looked in Seen Straw for Broom he lefted me Cut and I Could tell and tell of many many things that came back to mind. Can almost See him Coming down the Path by Scuppermong vine with his bucket of Sweet Milk get the Scales and weigh the milk and Say guess how many Pounds. I Carried in Most of the Stovewood as he had to do the milking for years on account of Exemia in my hand. Sometimes he brought in wood and would Laugh and Say you owe me a Nickle I would tell him I will Cook you Some biscuit for that a lot of times he would finish Churning take the milk to the Cellar. He was a man who Kept his business Straight dealt with a lot of People never made many bad trades he told me a lot of times he wished he could live with me a Hundred years and I can say the Same of him Though we did not agree on Some things take everthing Concidering I guess we lived a normal happy Life together as most Couples ever did. I made many many mistakes but I believe I did my best in a few things. He used to tell me I was one in a thousand So I guess he lived Happy with me with all my Faults though they Say Love Covers a multitude of Faults. Oh the Happy Days Ends with one another here but I trust we Shall meet in that beauteful Home on High some day where there will be no Sickness no Lonelyness... no Death, no Tears. Jesus made it Possable for us as Sinful Mankind to gather up there if we will do our best to Keep his Commandments. He Knows how weak and Frail we are. Knows what is best for us every one. A few more day on Earth to Spend and all my Trials and Cares Shall End. This is a True Story I wanted to tell as best I Could while I could remember some of the things that has passed. Home. There is no Friend like Jesus and no Place like Home. Mother's Hand and Heaven is the Sweetest words in the English language the poet said years ago the End of my Story April 27, 1942. There was Several beautiful Small Streams on the Place beautiful woods a lot of different Kinds of Timber. Oh it was a Lovely Place. Could See the Dear old Church Home from our Home. Handy to Store, Mill, Gin. We used to make a good Living. Staid out of Debt all our married Life he always told me about every Trade he made or planned to make in fact we went 50=50 in all our business always went to Church and S S [Sunday School] with our Children tried to Set good examples before them to be Honest and Truthful in all their dealings but they had to work yet he was always Kind and nice to them he was Firm with them but Considerate in all his dealings. Was a good Provider a good business man a good Father good Husband and Friend. Always looking to the Future for his family. He Loved Life as well as any Person I have ever Known. He use to Say be Sure you are right then go ahead. He was very Calm and very Considerate in most things. Oh how we use to love to Sit and talk after the day's work was done and Plan how to manage for the best every way. Then in 1917 our two Sons were drafted for the World War. They Staid in the Service 2 years one year over Seas that was a very Sorrowful uneasy 2 years we Spent but we worked made all we Could and Saved all we Could. Then the Happy Day Came when the war ended the 11 day of Nov 1918 and oh how our Troubled hearts rejoyced when the good News Came the war was ended, we rejoyced with all our hearts and longed for the Dear boys to come home from over Seas. We Trusted in our dear Father in Heaven and He had Compassion on us as unworthy as we are and our Darling Sons Came home in May and June in 1919 that was a Great relief and a happy time when we received the Children all Safely at their Childhood Home again. Praise God for all His goodness to us. Then they Married I and my Companion were left like we started but we worked right on for our Selves and others as well. We enjoyed the Children to come on their Vacation always Worked to have Water Mellons Plenty of Garden Stuff Milk and butter. Oh how we enjoyed those Happy days. Martha Culpepper, 3, F, GA.
McElwain Baptist Church Cemetery, 4445 Montevallo Road, Birmingham, Jefferson Co., Alabama. + Georgia Ann Culpepper, 1861 - 1938. Minnie Culpepper, Niece, F, Sng, Wh, 7, AL/AL/AL. John Culpepper married Georgia Lambert on 25 Apr 1883 in Saint Clair Co., Alabama. Nathan Gamble Culpepper, 2314 32nd Avenue, Birmingham, Jefferson Co., Alabama, age 27, born 22 Nov 1889 in Chalkville, Jefferson Co., Alabama, Employed as a Barber by K. M. Maloney of Birmingham; Married with no children; Caucasian; No prior military service; No exemption from service claimed; Short height, Stout build, Gray eyes, Brown hair, Not bald, No disabilities. Registered 5 Jun 1917 at Birmingham, Jefferson Co., Alabama. + N. Gamble Culpepper, 22 Nov 1889 - 4 Feb 1943. Comer Culpepper, Son, M, Wh, May 1898, 1, sng, AL/AL/AL. Comer Culpepper, Son, M, Wh, 9, sng, AL/GA/AL. John W. Culpepper died Mar 1938 in Jefferson Co., Alabama. Georgia A. Culpepper died Jun 1938 in Jefferson Co., Alabama.